What are some circumstances that cause a windshield replacement? If you have a crack in your windscreen then there are reasons that you should get your window replaced quickly. Even a small chip or crack in the windscreen can obscure your vision. Hence, which can prevent you from reacting quickly to upcoming hazards. Small cracks can compromise the durability of your windshield. Furthermore, it might be that the next stone or pebble goes straight through the glass and causes an injury! Your windshield might be easier for a trespasser to break into if it is damaged. Gaps in your windshield could let in moisture which in turn could damage the interior. Chips in your windshield can get worse over time. So you should get the problem dealt with as soon as possible. A cracked windshield can severely undermine the look of your car. Wouldn’t it be nicer to have it looking as good as new? At Grand Prairie Auto Glass, we offer quick and affordable windshield replacement. We’ll have a completely new windshield installed on your vehicle in no time. Did you know that your windshield is more than just a sheet of auto glass? In order to provide you with the maximum safety and security, your windshield actually employs a very smart design. This is actually two identical sheets of glass that are aligned perfectly together with a thin layer of air and double-sided adhesive laminate plastic through the middle. This serves the purpose of providing additional insulation, while at the same time holding your glass in place even if it breaks. What’s more, it means that if your windshield is hit by a pebble or a stone, it’s unlikely to go through both layers of glass. On top of that, your windshield will be attached firmly in place and bonded to the frame of the car at the molecular level. This enables the windshield to actually add to the structural integrity of your vehicle, such that it can help hold the roof up if it should roll over! 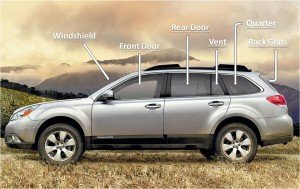 Other windshields also have additional features. For instance lane departure or rain sensor. When you use our windshield replacement services, we make sure that your new windshield is just as secure, safe and functional as the original so your car will be just as good as new – or better even! We handle the process quickly at a low cost too, so you won’t need to take a huge amount of time out of your day. Do You Need Windshield Replacement? If it’s only the first layer on your windshield that’s damaged, then you might not need a new windshield replacement. Consequently, it might be sufficient to simply repair your existing auto glass. If you bring your car in we’ll have you in and out in no time.